The latest scam to enter the debate about so-called “global warming” involves spending billions of dollars to spray the atmosphere with tiny particulate matter for the alleged purpose of reflecting sunlight back into space, and thus cooling the planet. But research into this controversial practice of “chemtrailing,” which has actually already been going on for quite some time now, is largely funded directly by Mr. Vaccine himself, the infamous Bill Gates. The U.K.’s Guardian paper reports that Gates, who is a huge advocate of global intervention programs that forcibly affect large people groups whether they like it or not, has been spending untold millions of dollars from his own personal fortune to fund research into geo-engineering programs. These funds are being used to study things like how much it will cost every year to blast the skies with tiny particles of sulfur dioxide, a toxic industrial byproduct linked to serious respiratory illnesses like asthma (www.epa.gov). 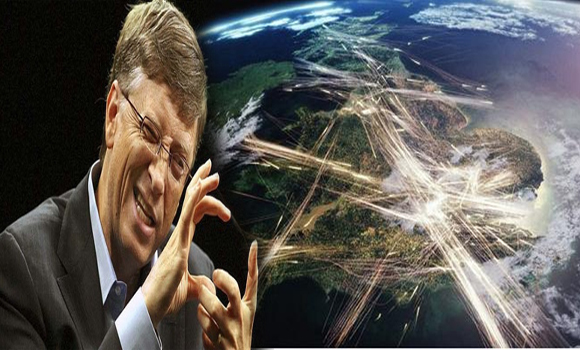 Gates and his small cadre of allies, which include co-founder of Skype Niklas Zennstrom and owner of the Virgin Group Sir Richard Branson, reportedly spend exorbitant amounts of cash every year trying to push geo-engineering initiative across the globe. They claim that if nations like the U.S. will not cut greenhouse gas emissions by tremendous amounts, the spraying of toxic poisons into the atmosphere will be necessary to thwart impending disaster. Geo-engineering does, however, give unprecedented control over the world’s weather patterns to a select few, allowing them to manipulate the environment for their own gain in the name of saving the planet. And blocking the sun’s rays with tiny particles also serves much more sinister purposes like preventing humans from absorbing much-needed ultraviolet B (UVB) rays from the sun, which are responsible for producing vitamin D in the body (www.vitamindcouncil.org).